Jamie Hudson is currently conducting field and lab work for his PhD in South Africa at Rhodes University. 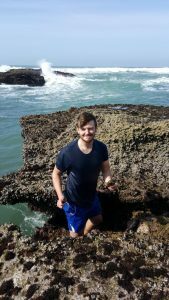 By performing laboratory crosses on two species of ascidian, Pyura herdmani and Pyura stolonifera, Jamie is assessing the extent to which hybridisation and climate change may affect their species ranges. This is work in collaboration with Profs. Christopher McQuaid and Peter Teske.